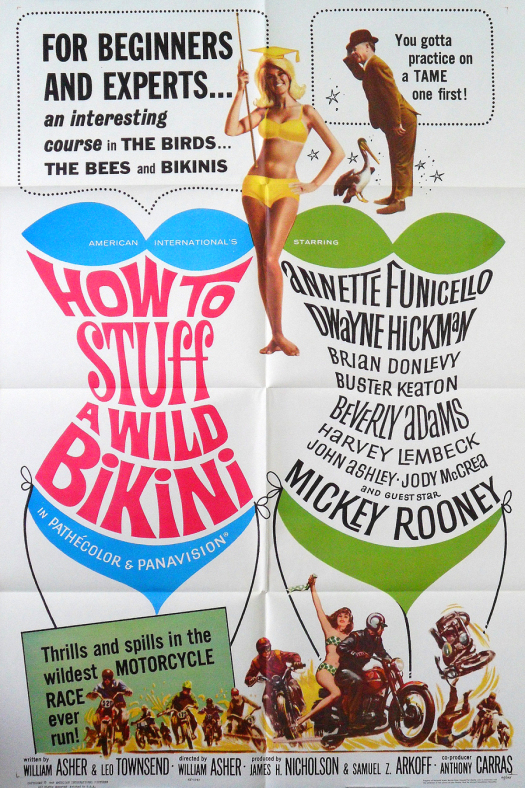 Last night, I watched the 1965 beach film, How To Stuff A Wild Bikini. Why Was It Watching It? Last night, I was in a motel room in San Antonio. Now, as I’m sure we all know, one of the great things about staying in a motel is that you get a chance to discover all sorts of strange television stations that you otherwise may not have known existed. It was while flipping through these odd stations that I came across the final ten minutes of Dr. Goldfoot And The Girl Bombs. Dr. Goldfoot was followed by How To Stuff A Wild Bikini. Oh Lord, where to begin? Okay, so Frankie (Frankie Avalon) is serving in the U.S. Navy and has been assigned to Tahiti. However, he’s worried that his girlfriend Dee Dee (Annette Funicello) might not stay true to him while he’s gone. Why he thinks that is a good question because, seriously, Dee Dee really doesn’t seem to be the type to cheat. 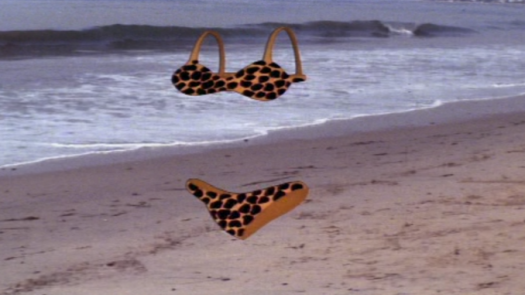 Frankie goes to the local witch doctor (played by Buster Keaton) who casts a spell that causes a magic bikini to appear on the beaches in California. “Man,” one surfer says, “dig that wild bikini!” “A bikini ain’t nothing without the stuffing!” his girlfriend replies. Suddenly, Cassandra (Beverly Adams) appears, providing the “stuffing” for the magic bikini. Cassandra has been sent to the beach to keep an advertising executive (Dwayne Hickman) from stealing Dee Dee from Frankie. Oh! And the witch doctor also turns Frankie into a pelican so Frankie can fly back to the beach to keep an eye on Dee Dee. And Mickey Rooney is in this movie! And there’s a motorcycle gang! And … it’s a musical! This was exactly the type of mid-1960s youth film that I like almost despite myself. Plotwise, it was pretty incoherent. Acting-wise, it was nothing special. The songs were not memorable. The attitudes were sexist. The entire film felt cheap. And yet, it was so weird and energetic and sincerely silly that there was no way I couldn’t like it. If nothing else, watching this film is probably as close as I’ll ever get to experiencing 1965. After having seen several of his silent films on TCM, it was a bit sad to see how Buster Keaton ended his career. Cassandra had red hair, just like me! Redheads unite! Plus, I’ve been told that I look good in a wild bikini. A bikini ain’t nothing … without the stuffing!